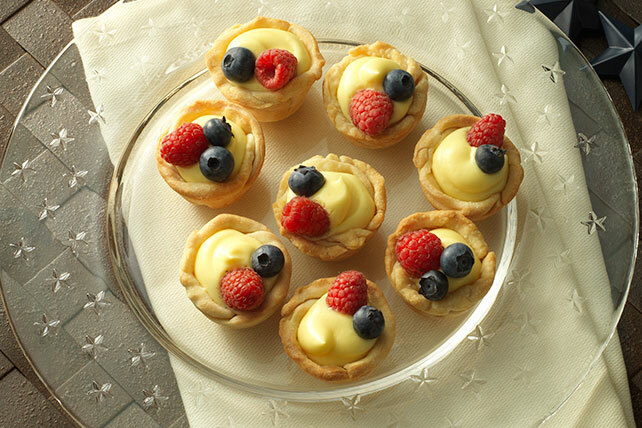 Get a taste of fruit tart heaven with these JELL-O Patriotic Mini Fruit Tarts! Make these JELL-O Patriotic Mini Fruit Tarts for your next party! Spray 24 mini muffin pan cups lightly with cooking spray. Cut each pie crust into 12 wedges. Press 1 wedge up and around inside of each prepared cup to form shell, pressing edges of dough together as necessary to completely cover bottom and side of cup. Bake 10 to 12 min. or until golden brown; cool slightly. Remove to wire racks; cool completely. Meanwhile, beat pudding mix and milk in medium bowl with whisk 2 min. Stir in COOL WHIP; spoon into resealable plastic bag. Refrigerate until pie crusts are cooled. Cut off one bottom corner of filling bag; use to fill pie crusts. Top with berries just before serving.